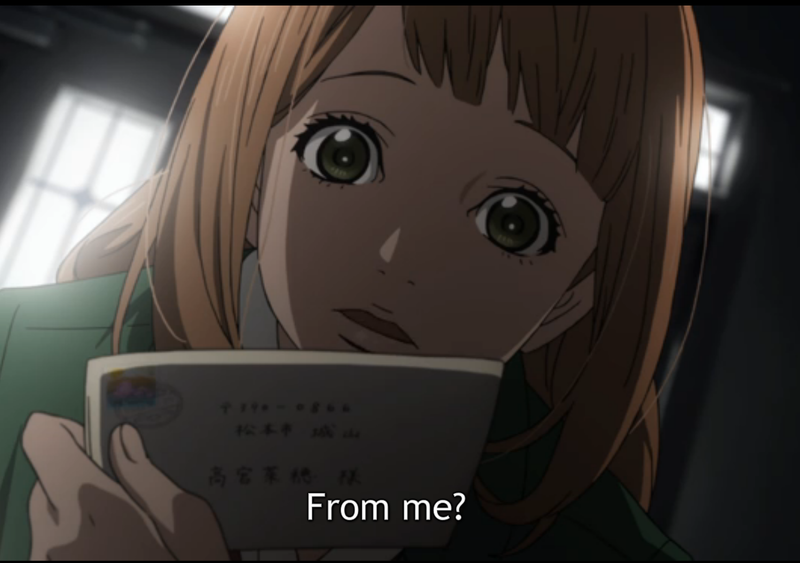 Summary: During the spring of her second year of high school, Naho receives a letter. Its sender is herself from ten years in the future. Naho thinks it's a prank at first, but when the things written in the letter start to come true one by one, she realizes that the letter is telling her events that will happen in her future. It tells her that she'll fall in love with Kakeru, a new student who transfers to her school, and that he'll die in the winter of his 17th year. After learning the regrets and wishes of the 26-year-old Naho following Kakeru's death, what can the 16-year-old Naho do differently? First Impression: Simple. I would describe this show, as simple. It has a very simple premise, and even though the plot features a rather amazingly complicated thing, time travel, they do not give any shits about explaining that. It is literally a plot piece at this point, and everything is about the characters, and y'know what? I like that. It's a plot piece that enables the story to exist and move forward in an interesting way, in what is by far and large the dead pulped horse of a drowning setting, yet more fuggin' high school romance. My Opinion: I'm going to watch this one. It's really mellow, and peaceful, with nothing over dramatic in tone. Certainly, a dramatic occurrence is revealed at the end of this first episode, but over all, the tone of the show has a very calming effect on me. I really needed that, after my first proper day off in ~2 months got screwed over real hard. So hey, I have a bias. the whole 'letter from the future' thing, should keep this really fresh, and also prevent the show from meandering around, humming and hawing and delaying things from actually moving forward. Additionally, I find it very interesting that the first thing they do, is have her ignore an instruction from the letter, and that over all, the letter doesn't really seem to be saying there is a way she can save him from dying, at least not yet. If that's actually a thing, then I think it should make this show very interesting. Y'know. For a high school romance anime. Of which we have dozens.